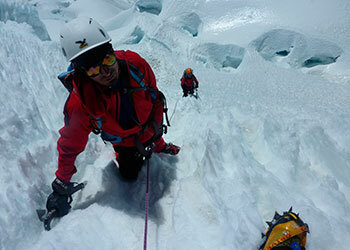 Climbing Nevado Pisco in the Cordillera Blanca. Arrival, Base Camo this mountain is one of the easier ones in this region, you should bare in mind that it is a real high tour with 30° ice passages and chinks on the glacier. 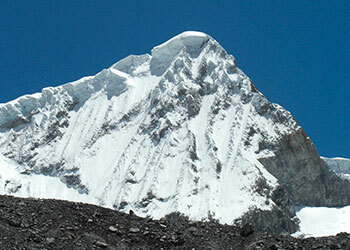 We start at Cebollapampa from where on a trail is leading us to the basecamp of the Pisco. After the first steep ascend a flatter part follows. After a further ascend and a small waterfall we will reach a small area, offering us a perfect place to build up our base camp. The Pisco could also be conquered within 2 days, but in order to acclimate us, we better spend some more time in this hight. Summit Quite some time before sunset we start our climbing to the top. Our headlamps lighting the way through stony grounds and easy glaciers. Later we pass a field of slidy rocks below the Huandoy glacier where we have to calculate with falling stones. On the other side of the glacier, thankfully, dark rocks serve us a better way to the top of Nevado Pisco, although they don't seem to be quite consistent. 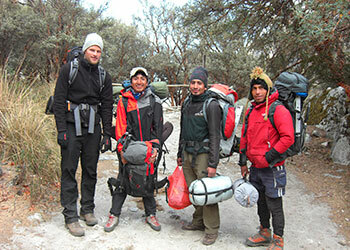 Soon we have arrived at the entry to the glacier of Nevado Pisco. In the majority of cases there is a clear trace showing us the way to the saddle. 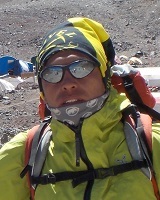 So, we have to follow the steep ascend before reaching the top of 5760 meters. Not only the highest mountain Peru's, the Nevado Huascaran, but also several other mountain giants can be observed from here. Also Huandoy and Chopiqualqui appear in the direct neighborhood. After our breakfast we will coming down to Cabollapampa - our private transport are waiting fot us.